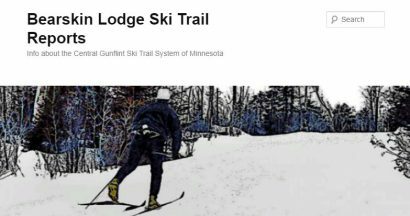 The Central Gunflint Ski Trail System is a joint project of Bearskin Lodge and Golden Eagle Lodge. We work together to maintain the trail system; each resort grooms and maintains about half of the entire system. We all take pride in the high quality of our trail grooming. Both of our families are life-long cross country skiers. We understand that great grooming is what makes great skiing possible. If you’re staying at either resort, you and all members of your group receive trail passes for free. There’s nothing quite like stepping out your cabin door to start your skiing for the day. If you’re not staying here, day and season passes can be purchased at both resorts. You can find maps and info about the trails on the Bearskin Lodge Trail blog. We update it regularly with grooming reports and news about the trail system. 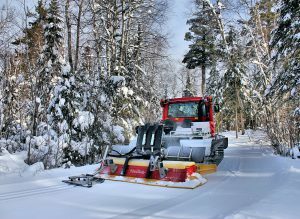 Bearskin grooms with a new Pisten Bully 100, which sets an 11 foot wide skate deck with beautiful corduroy for skate skiers and straight, firm tracks for the classic skier. This machine has cutting edge, 21st-century tilling technology, which makes it easy to create excellent cross-country skiing no matter what conditions Mother Nature throws at us. With this new machine, it’s easy to freshen up the snow and to recover from icy conditions. A small section of our ski trail system is within the BWCAW. 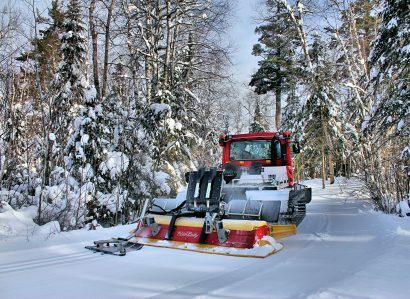 Regulations prohibit the Pisten Bully from entering the BWCAW, but we achieve excellent results in that section with the much smaller Tidd-Tech G2 groomer. It’s also handy for quickly erasing those pesky moose tracks that may suddenly appear on freshly groomed trails. We do winter well at Bearskin. Come up soon and enjoy all that winter has to offer.